Sir Hersch Lauterpachts's only son, Sir Elihu Lauterpacht, founded the Centre in 1983 and was its Director until 1995. It is through his vision, energy and commitment that the Centre has become the leading centre of activity in the United Kingdom in international law. He has had a distinguished career in international law practice and teaching. He was called to the Bar in 1950, became a QC in 1970, and practiced extensively before the International Court of Justice and other international jurisdictions, as well as before the English courts. He was ad hoc judge in the Bosnia case before the International Court and is a distinguished arbitrator. 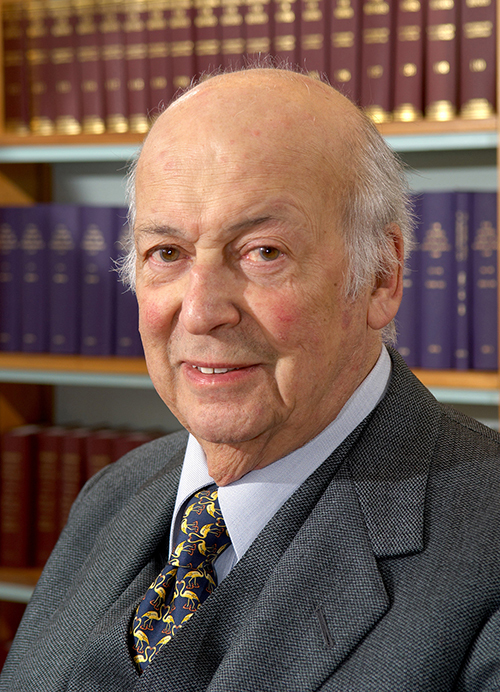 In 1953, he became a Fellow of Trinity College, Cambridge and was successively Lecturer and Reader in International Law in the University, being appointed an Honorary Professor of International Law in 1994. He has left a permanent mark on international law through his work as author, editor and innovator. He became editor of the International Law Reports in 1960, and inaugurated the Iran-United States Claims Tribunal Reports in 1983 and the ICSID Reports in 1993. He remains actively involved in practice as well as in the work of the Centre as its Director Emeritus. He was knighted in 1996. John Dugard is one of South Africa's foremost experts in public international law, jurisprudence, human rights and criminal procedure. After being awarded his BA and LLB degrees from the University of Stellenbosch, he was awarded a LLB, a Diploma in International Law and a LLD from the University of Cambridge. Professor Dugard currently serves as Chair in Public International Law and Director of the LLM programme at the University of Leiden. In addition, he is Professor Emeritus at the University of the Witwatersrand and Professor Extraordinary at the University of Pretoria. He is a member of the Governing Body of the African Society of International and Comparative Law and was the first South African elected to both the Institut de Droit International and the International Law Commission, where he is both a Member of the Bureau and Special Rapporteur on diplomatic protection. In 2000, he served as Judge ad hoc in the International Court of Justice. In 2001, he was named as Chairman of a UN Human Rights Inquiry Commission on violations of human rights and humanitarian law in the occupied Palestinian territories after September 2000. He currently is Special Rapporteur of the UN Commission on Human Rights, on the situation of human rights in the occupied Palestinian territories. 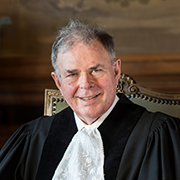 Professor James Crawford AC SC FBA LLD is Whewell Professor Emeritus at the University of Cambridge and current Judge on the International Court of Justice. Judge Crawford is a distinguished academic and practitioner in the field of international law. He left his position as Director of the Centre in 2003 to take up the role of Chair of the Faculty of Law. Following the departure of Daniel Bethlehem QC, Professor Crawford recommenced as Director, stepping down for the second time in 2010. Judge Crawford had an extensive practice in international law and international arbitration, appearing before the ICJ, ITLOS, ICSID and ICC tribunals. He has been an arbitrator in ICSID and ad hoc arbitrations as well as in inter-state cases, is a member of the ICSID panel of arbitrators, author of numerous books, and co-editor of the British Yearbook of International Law. He was previously a Member of the Australian Law Reform Commission (1982-1990) and the International Law Commission (1992-2001). He was the ILC Special Rapporteur on State Responsibility from 1997-2001. Daniel Bethlehem is now Legal Adviser to the United Kingdom Foreign and Commonwealth Office in succession to Sir Michael Wood. Prior to taking up this position, he was Director of the Centre, Lecturer at the Faculty of Law, University of Cambridge and Queens Counsel practising at 20 Essex Street Chambers in London. Mr Bethlehem has acted in a wide variety of matters across the full range of international law. He has appeared before the International Court of Justice, the International Tribunal for the Law of the Sea, the European Court of Justice, the World Trade Organization, the Iran-United States Claims Tribunal, the European Court of Human Rights and the House of Lords. He was a Panellist on the WTO Indicative List of Panellists and an Arbitrator of the Court of Arbitration for Sport and is the author/editor of a number of books and articles. Dr Charlotte Ku served as Acting Director from October 2006 to February 2007. Before coming to Cambridge, Charlotte completed a 12-year term as Executive Director and Executive Vice-President of the American Society of International Law (ASIL), where, among many other things, she coordinated a multi-million annual budget and led many successful development and sponsorship projects. While at ASIL, she also oversaw the development of the highly visible ASIL website and of outreach programs to the US judiciary and the media. In conjunction with the Academic Council on the United Nations System, Charlotte conducted annual workshops on global governance for academics, advocates, and government officials. She has also been a visiting professor at the John Hopkins University and an assistant professor in government and foreign affairs at the University of Virginia. Charlotte has served on a number of management and editorial boards, including the Academic Council on the United Nations System and International Legal Materials, and has herself published nearly 40 academic papers. Charlotte’s term as Acting Director of the Centre ended in February 2007, when she took up the leadership of the University of Illinois College of Law's Graduate and International Studies Programme. Professor Weller holds the Chair of International Law and International Constitutional Studies in the University of Cambridge. He is the former Director and a Fellow of the Lauterpacht Centre for International Law. He has served as United Nations Senior Mediation Expert and is a highly experienced international dispute settlement professional. He is certified and accredited as a professional mediator and was elected a Fellow of the Chartered Institute of Arbitrators. He is a barrister (Middle Temple) and Associate Tenant at Dougthy Street Chambers, London. Professor Weller holds Doctorates in International Law and International Relations, in Law, and in Economic and Social Sciences from the Universities of Cambridge, Frankfurt and Hamburg respectively, and Masters’ degrees from the Fletcher School and the University of Cambridge. Professor Weller also trained in advanced negotiation and dispute settlement at Harvard Law School and the Kennedy School of Government.